Flooding in downtown Reno during 1963. 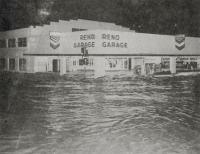 Looking at the Reno Garage at the southeast corner of 1st Street and Center. 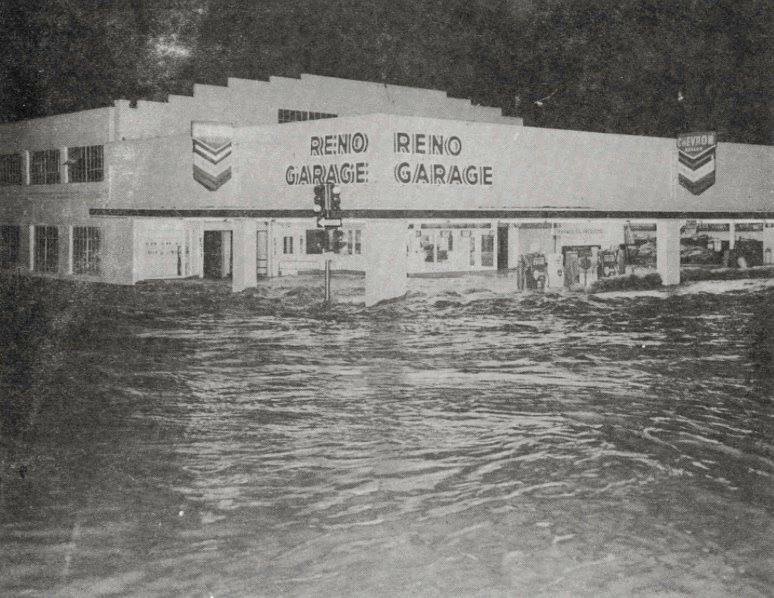 Source Caption: Nevada Weather Trivia: One of the great river floods to affect western Nevada occurred in late January into early February of 1963. Heavy precipitation fell for 72 hours, with snow levels above 8000' in the Sierra. The heavy rainfall quickly filled streams, creeks, and eventually mainstem rivers. There was actually a sparse snowpack that season, which had seen limited storm activity. The Truckee River at Reno crested at 14.4' on February 1, 1963, marking the 3rd highest crest ever officially observed (higher than 1997 and only short of the great floods of the 1950s when there was limited upstream storage). — with Photo: Nevada Historical Society.